Apprentices, trainees and employers celebrated! 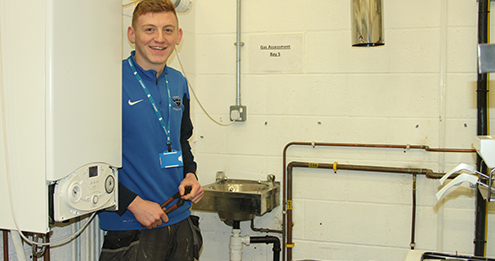 The competition is hotting up for a Bradford College plumbing student in his bid to be named the best in the country. Edward Jackson, from Keighley, will compete in the HIP UK Heating Apprentice of the Year final after winning the regional heat. The 20-year-old from Keighley, who works for H2K Plumbing and Heating Services Ltd in Skipton, triumphed at the North West regional heats which took place at Burnley College. He scored top marks with the judges after completing a six-hour task which required competitors to pipe-up a boiler, radiator and shower – testing their knowledge, technique and speed. Edward will now go up against the winners of the other heats from across the country in the grand final in Cheltenham in March for the chance to be crowned HIP UK Heating Apprentice of the Year 2019. “I was really pleased with myself for winning. I wasn’t expecting it and there were a lot of very good plumbers there,” said Edward, who is in the second year of his four-year plumbing apprenticeship. Chris Webb, Edward’s tutor at Bradford College, said: “The judges said the standard of competition at the North West heat was very high so it is a real testament to Edward that he came out on top. Some of the competitors didn’t even finish in the allotted time. Plumbing is one of a vast range of apprenticeships offered at Bradford College. Anyone ready to learn more about the types of apprentices available and how to apply can attend our open event on Tuesday, February 12, between 4.30pm and 6.30pm at CTS offices in Chapel Street, Little Germany, BD1 5BY.